Summer is in the air. As the nights heat up, it’s a perfect time to get outdoors and entertain in your garden. Chicago Botanic Garden floriculturist Tim Pollak shares how you can bring the party to your garden with a few simple tricks for evening entertaining. 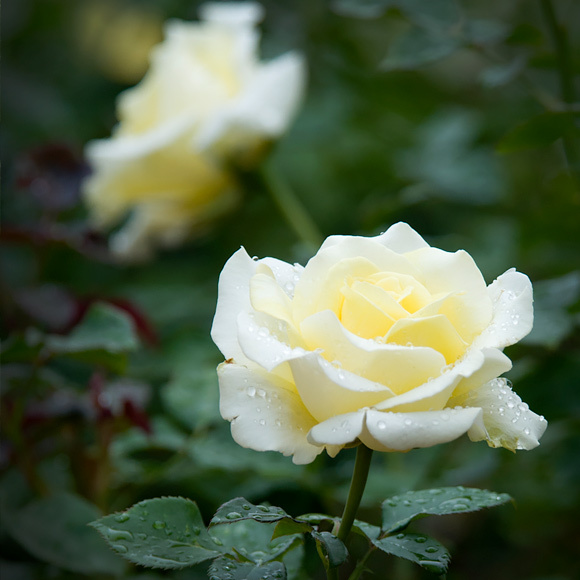 Enhance the darkness of evenings by planting white or cream-colored foliage and flowers. White flowers and plants create brightness in your garden by reflecting moonlight, candlelight, and firelight. Some flowers even “glow” in the moonlight, including white and yellow lilies. 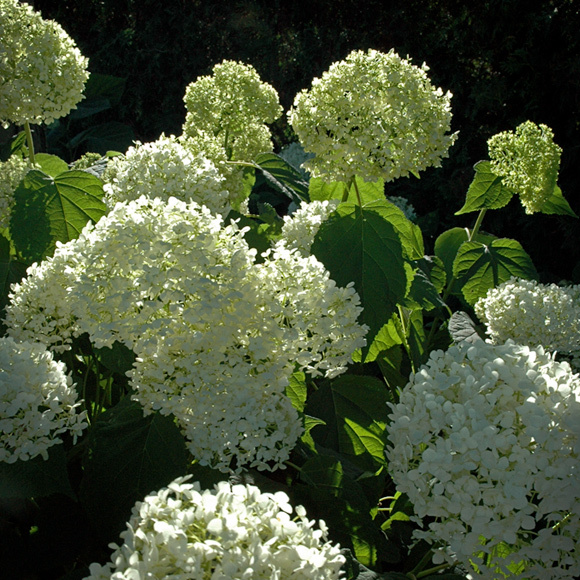 Pollak recommends flowering shrubs such as hydrangea, roses, and hibiscus. In areas where you can sit and entertain, use plants that emit mood-setting fragrance. 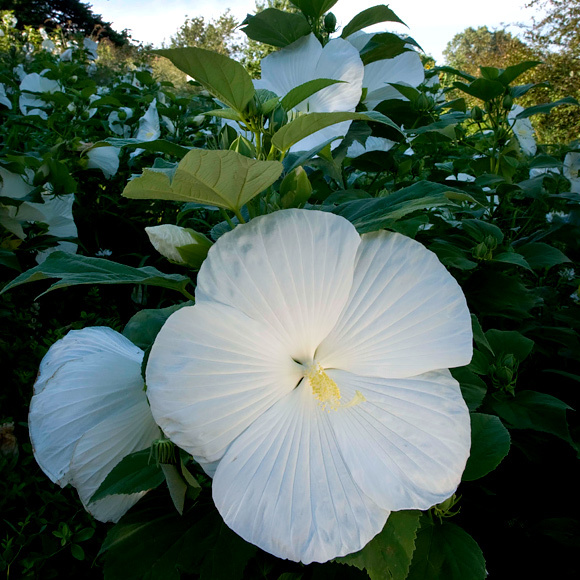 Scent in a garden carries farther and longer in the evenings than in daytime, said Pollak. Plus, evening blooming plants often give off strong fragrance that attracts night-flying pollinators (additional guests for your party). Some examples of especially fragrant plants include heliotropium, nicotiana, and ipomoea alba. Lure guests down the garden path with purposefully placed outdoor lighting. You can shine focal points on specimen plants, and create wonderful shadows and backlighting effects that will enhance the setting of your evening party. People are drawn to fire pits, which create a campfire-like atmosphere, said Pollak. Fire pits also serve as focal points in your garden, providing warmth, light, and a cooking source. Stay warm on cooler nights, and enjoy the light and ambience that make fire pits a natural gathering spot for entertaining. Many fire pit options are available, including natural or electric, modern or traditional, in-ground or portable. Be sure to consider the placement of seating as well, with flexible options in case of wind and smoke. Nighttime atmosphere can make for a magical evening. A few sensory features such as white or gray painted structures or statues, wind chimes or fountains will add the perfect finishing touched to your evening ambience. Mosquitos are never a welcome guest at a nighttime gathering. Keep them at bay by eliminating all standing water. You can also use citronella (including the actual citronella plant, or candles, lamps, and tiki torches) to help keep them away. 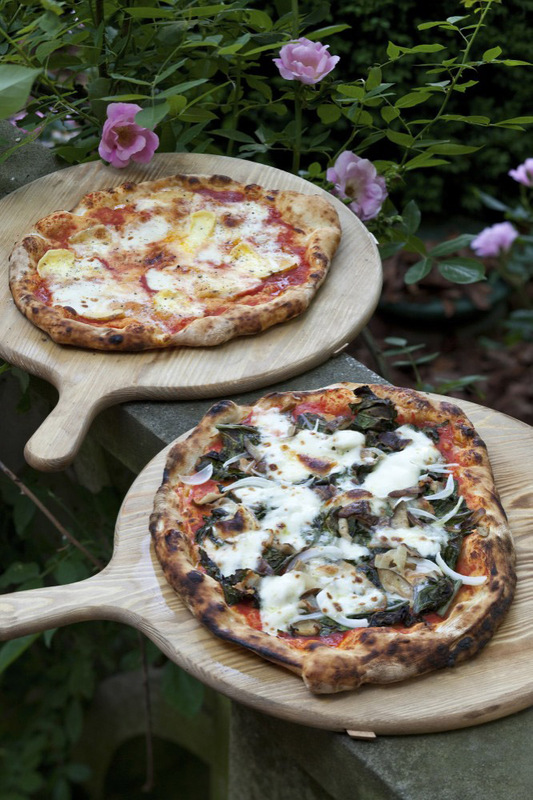 Fresh herbs, terra cotta pots, and seed packets grace the tabletop for a summer pizza party at Boxwood, the Atlanta residence of Danielle Rollins. Danielle Rollins, preeminent Atlanta hostess and tastemaker, has a special connection to Chicago—a place that’s very close to home. Rollins lives in the stately home, Boxwood, that was built by Eleanor McRae in 1928 as a small-scale version of her Lake Shore Drive childhood home. Designed by architect Philip Shutze, Boxwood has been lovingly refurbished and serves as a gracious setting for the inviting parties Rollins shares in her book, Soirée: Entertaining with Style. Q: Chicagoans are only able to entertain outdoors in the warm summer months. Can you suggest some ways to bring the grace and warmth of the South to our Chicago parties? A: I think the key to entertaining in any of the four seasons is to focus on what makes your guests feel welcome, wanted, and happy. There are so many great celebrations coming up—Easter, Mother’s Day, or simply just because! To me, summer is about outdoor entertaining. You’ve got nature as your inspirational backdrop and that should be your focus, with everything else blending into that. I love bringing the indoors outside. Without hesitation, I will incorporate my heirloom china as the place settings on a rustic table or have a full-blown picnic. Don’t be afraid to mix old and new, high and low. You don’t have to have the perfect items for entertaining. Stadium blankets, quilts, or even bed linens make the perfect table topper; I have even been known to use shower curtains as outdoor tablecloths! For your arrangements, nature provides everything you’ll need—as long as you have the clippers. With all this talk of nature, I offer my final suggestion for any fête: always make sure you have a backup plan; Mother Nature is a notorious party crasher. Food does not have to be complicated or fancy to be pleasurable. Q: At the Chicago Botanic Garden, we encourage visitors to grow their own vegetables and support local farmers. How can these ideals be incorporated into entertaining? A: I love shopping at my local farmers’ market down the street from me. I recommend shopping without a list. Go through and see what’s available and what’s local and build your menu around that. I can get really excited about radishes, carrots, English peas, asparagus, and fresh strawberries in early spring. What’s seasonal and what tastes best at the moment is my building block for any venue. The tabletop and flowers come second. One of my favorite dinners I have ever orchestrated was a dinner with Blackberry Farms to honor heritage Southern farmers, complete with a flock of sheep on my front lawn! I used simple vases filled with a variety of wildflowers, and the place cards and napkins were tied with twine. 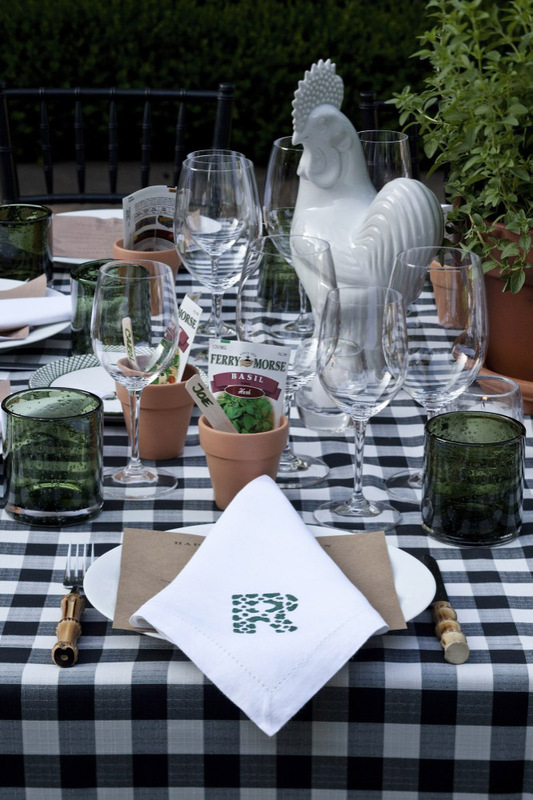 The menu featured heirloom vegetables and mint juleps sweetened with sorghum. I think there’s nothing prettier than huge mounds of vegetables or fruits on a table. You don’t even need flowers. Q: You’re known as a “gracious living” expert. What does that term mean to you? 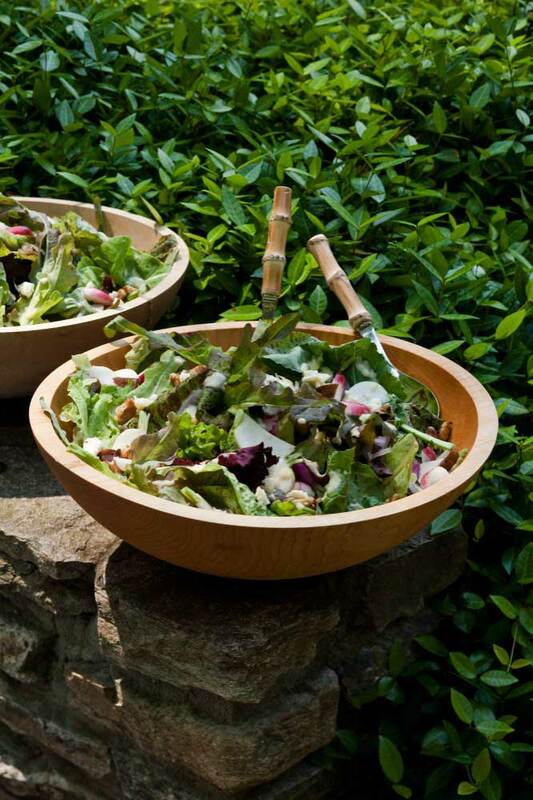 Simple ingredients served in abundance, such as fresh salad from the farmers’ market, bring grace and style to a summer party. A: Gracious living means having a sense of grace. It’s the one thing we can give to each other and to ourselves that makes life worth living. It means slowing down and focusing on each other. It means working to live, rather than living to work. Be kind to each other. Be kind to yourself. Take the time to enjoy the details. I think that’s something that’s hard for us all to do. The same thing translates to entertaining. Focus on what makes your guests happy and what gives them pleasure, and ultimately that will bring you pleasure. Q: You’ll be a keynote speaker at the Antiques & Garden Fair, along with your friend and colleague Miles Redd. What have you and Miles learned from each other? A: Miles is a great friend, and we share the same birthday. We met in 2001 and can finish each other’s sentences. He taught me a sense of scale, not to be afraid to change things, and that every room needs some sparkle! While Miles is a rule breaker, at heart, he’s really a traditionalist. He is also, without question, the reason I wrote my book. Miles is good at recognizing talent, but he’s even better at pushing that talent to realize their dreams. Try a new twist on a classic cocktail—download this recipe! Pour some celery salt or Old Bay seasoning in a small plate. Squeeze lemon or lime juice into a small bowl and dip the glass rim into the juice. Roll the outer edge of the glass in the salt or seasoning until fully coated. For extra zing, use Tabasco sauce instead of the lemon or lime juice. Add the remaining ingredients into a shaker and fill with ice. Shake gently and strain into the prepared glass. Garnish with celery stalk (with the leaves on) and a strip of candied bacon (see recipe below) or a bamboo skewer of olives, tiny grape tomatoes, and a lime wedge. Preheat the oven to 400° F. Line two rimmed baking sheets with foil. In a small bowl, whisk the brown sugar with the chile powder. Arrange the bacon strips on the foil and coat the tops with the chile sugar. Bake for 20 to 25 minutes, until caramelized and almost crisp. Transfer the bacon to a rack set over a sheet of foil to cool completely.